Our exclusive series of articles that teach you all the tips and tricks you’ll need to successfully self-publish. Two weeks ago we taught you how to sign up for Goodreads and create your own account using the Author Program. However, to get the most out of your Goodreads profile, you have to be able to use it as a reader as well. Otherwise everyone will think you’re only interested in promoting yourself without actually getting involved in the community! The easiest and best way you can use your Goodreads account to the fullest is by reviewing the books you’ve read. We showed you what the front page looked like last time around — now let’s take a look at the “My books” tab. The left side of the screen lists all the different bookshelves on which your book reviews are listed. Originally you start out with “read,” “currently reading,” and “to read,” but you can also create your own by clicking on “add shelf” below. I like to categorize mine by genre, though I also have several shelves to delineate the books I read in high school and college. 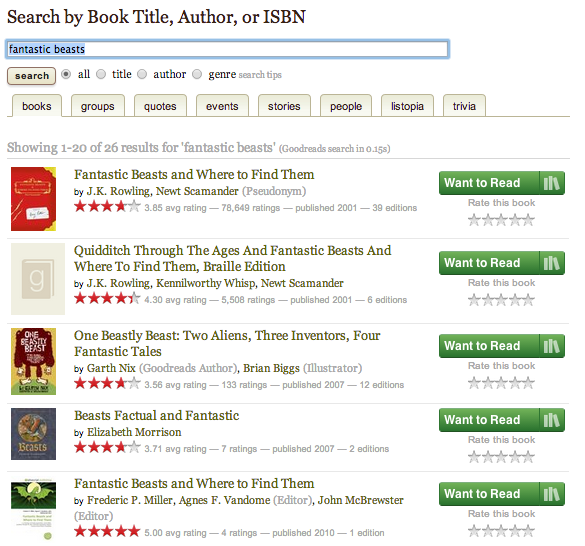 To add a new book to one of your shelves, go to the top search bar where you can input a title, author, or ISBN. 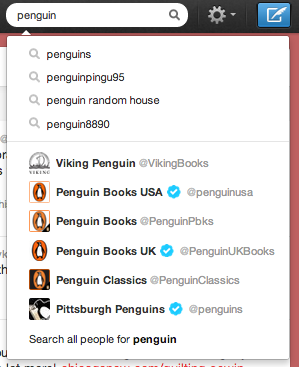 Now, if you want to, you can add a book to your bookshelf right here by clicking on the “Want to read” button. Clicking that will automatically add it to your “to-read” shelf, but you can also move it to whichever shelf you want using the button to the right. You can also add a quick 1 to 5 star review here, if you’d like. But what if you’ve already read the book you’re adding and you want to write up an elaborate review to share with friends and other likeminded readers? The easiest way to do that is by clicking on the title of the book in question to access its individual page,, and editing a review from there. 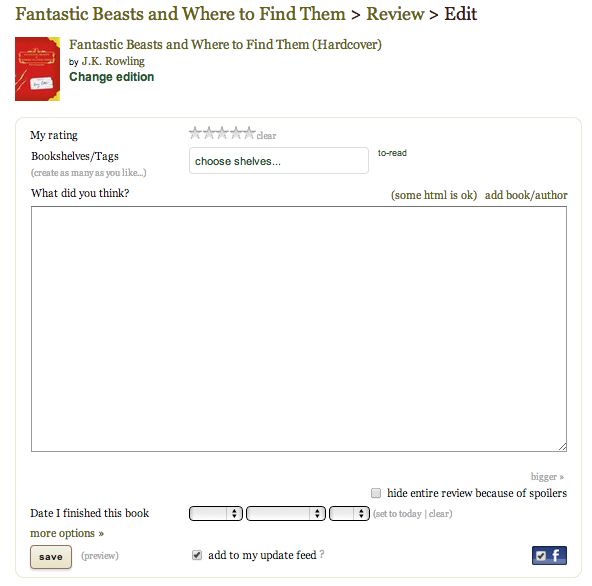 From here you can choose shelves, change the edition that you’re reviewing, edit the date that you finished the book, and write your review. The more reviews you write, the more you’ll be able to share your views with other Goodreads users, and the better your reputation will be as a reader and writer. 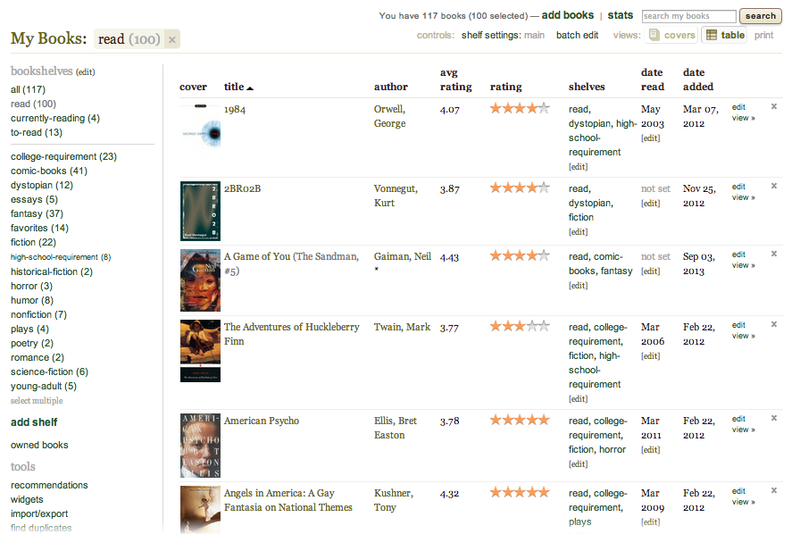 When you add and review more books, you’ll also get better recommendations using the Goodreads “recommendation” engine. Just don’t spend so much time writing reviews that you forget to write your own book! Keep your exclamation points under control. Of course, the actual essay is much longer and expands on these ten rules, making it definitely worth a read in its entirety (you can also buy the whole book here — it’s great to have on a shelf!). But there’s certainly a theme to Leonard’s rules: what’s important to him more than anything else is the plot. If you’re looking to tell a story, tell it; too much detail or too many clichéd phrasings will detract from the distinct story you’re trying to tell. Say what he is proposing to say, not merely come near it. Use the right word, not its second cousin. Employ a simple, straightforward style. And then there’s one of my all-time favorite pieces of writing advice from Kurt Vonnegut’s A Man Without a Country. Speaking of which: what if you like weather or detailed descriptions of characters or semicolons? You’re not completely out of luck. Mark Twain himself isn’t always necessarily simple or straightforward, after all – and he certainly doesn’t shy away from writing in dialect. Does that make him a poor writer by Leonard’s or even his own standards? Of course not. These rules aren’t telling you that there’s only one way to write. What they’re trying to to is get you to think about what makes a story and what you might do to write your story more deliberately. Oftentime using a set of rules when you’re creating something can help you come to a place that you wouldn’t have gotten to on your own without those rules. Sometimes it’s even just great for practice. That’s why so many people look to conventions when they write poetry – sometimes having to stick to a fixed rhyming scheme or metrical pattern can inspire you to overcome obstacles that you might usually encounter in your writing. Sure, conventional wisdom tells you not to confine yourself to coloring within the lines, so to speak, but sometimes forcing yourself to stay within those lines can have unexpectedly pleasant consequences. Of course, the truest way to hone your writing skills is reading and writing as much as you can – the more you read from other authors and the more you practice writing yourself, the closer you’ll come to idetifying and developing your own voice. 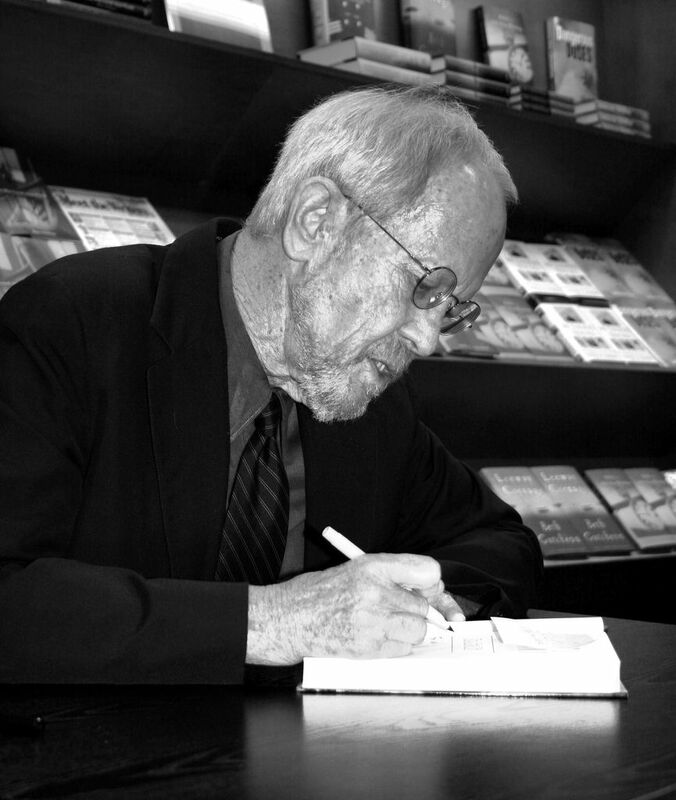 That’s why even if you aren’t planning to follow any of Leonard’s rules – or anyone else’s, for that matter – it’s helpful to read as many of them as you can and pick and choose which ones you’re going to follow. Trust me, it helps! What is Klout? Can It Help You Manage Your Social Media Presence? If you’re very active on a wide range of social media networks, you’ve probably heard of the website Klout. Launched in 2009, this application boasts the ability to track how influential you are on sites like Facebook and Twitter and calculates that influence into a simple numerical score. But how successful is it at figuring out just how influential you are? Is it worth signing up for? Today we’ll take you through the basics of what Klout does and whether or not it can do anything for you as a self-publisher. This is my Klout dashboard. As you can see, it calculates a score for you each day and charts whether or not that score has grown or diminished over a period of time. The scores range from 1 to 100 — the more influential you are, the closer you get to 100. It also shows you the most recent activity that impacts your score — though it’s not completely up to date! Klout also shows you where your influence reaches on each social media network — though it’s currently only calibrated to Facebook, Twitter, Google+, Linkedin, and Instagram. Of course, it responds most favorably to Twitter, and measures influence there by using your following count, follower count, retweets, list memberships, how many spam accounts are following you, and the Klout scores of those who are interacting with you. When you click on “Network breakdown,” this is what you see. Apparently I’m most influential on Twitter by a long shot, but there are also a good number of people interacting with my Facebook posts as well. 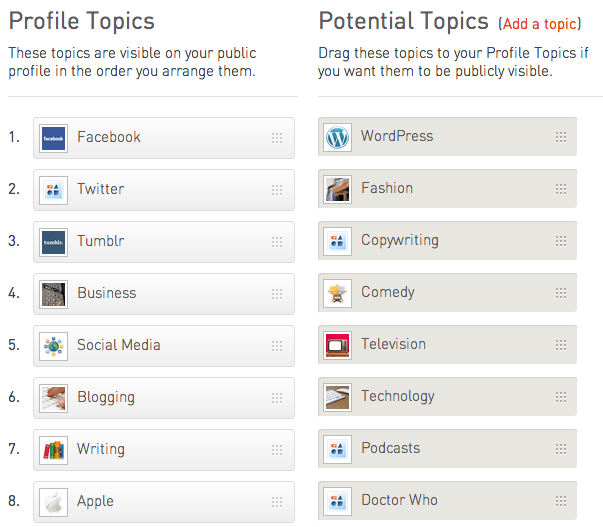 As with LinkedIn, Klout also gives you opportunity to boast what skills you have and what you’re most influential in. Usually it will try to guess where your influence lies based on what you’ve talked about in your tweets and Facebook posts, and occasionally it will get things wrong. However, you can always choose to highlight different skills so that your Klout topics better reflect what you’re actually interested in. They’re not wrong about my interest in Doctor Who, by the way. It’s a great show! Your score isn’t just good for bragging rights, of course — you can also snag great coupons and exclusive deals through Klout’s partnerships with other companies. For example, as one of the “perks” of using a Klout account, I’ve been offered everything from free magazine subscriptions to organic cocktails shipped to my door. It’s also possible to get a Klout score for your business or brand as well, if you have a specially branded Facebook page or Twitter account. But how important is it that you know your Klout score? Honestly, it’s hard to tell right now — but it’s probably not all that important. Currently it’s difficult to figure out how exactly how they calculate their scores – a few years back I even knew a person who worked in social media for a living and who had a Klout score of zero. There was also controversy a few years back that President Barack Obama had a lower Klout score than some professional bloggers, which clearly isn’t indicative of the level of influence Obama has at all. So obviously there are still some kinks that need to be worked out! However, Klout is useful in that it gives you an idea of which social media network you use gets you the most attention, so you can decide whether or not it’s worth focusing exclusively on one network. If you put a lot of energy into curating your Google+ page, for example, and find that you don’t have a whole lot of followers or people interacting with your content there, then it might be best to move in and devote your time to something else. Similarly, if you like tweeting pictures to your followers and realize that you have an instagram account you never use that a good chunk of people follow, you might want to start tweeting those pictures through the instagram account so that more people see them. All in all, Klout is a great way to sync all your networks up together and track them from one consolidated site – and it’s just fun to see how someone asking you a question on Twitter can influence and change your entire web presence. And the perks are pretty great, too! Best of all, it’s free to use, so it couldn’t hurt to give it a test run and see what new things you can learn about the social media networks you use. Try it out for yourself here and let us know what you think. 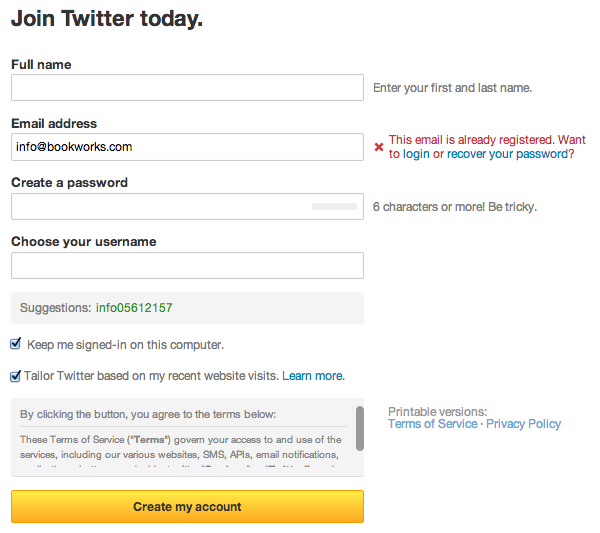 It’s very easy to sign up for an account — all you have to do is connect with Facebook or sign in using your Twitter account. No need for a new password or log-in. Let’s say you want one Twitter account for all of your personal tweets and another for a book you’d like raise awareness for. How do you manage two accounts at once? You could just log in and out of each account, but that can be a lot of work. That’s why a lot of people who use Twitter professionally have separate third party applications that they use not only to tweet from two accounts at once, but to schedule tweets in advance and so much more. Here are the top four apps that Twitter gurus love — why not try one out for yourself? Not only is this app free to use and created by the team behind Twitter.com, it’s super customizable so you fit each column of the app to suit your personal preferences. 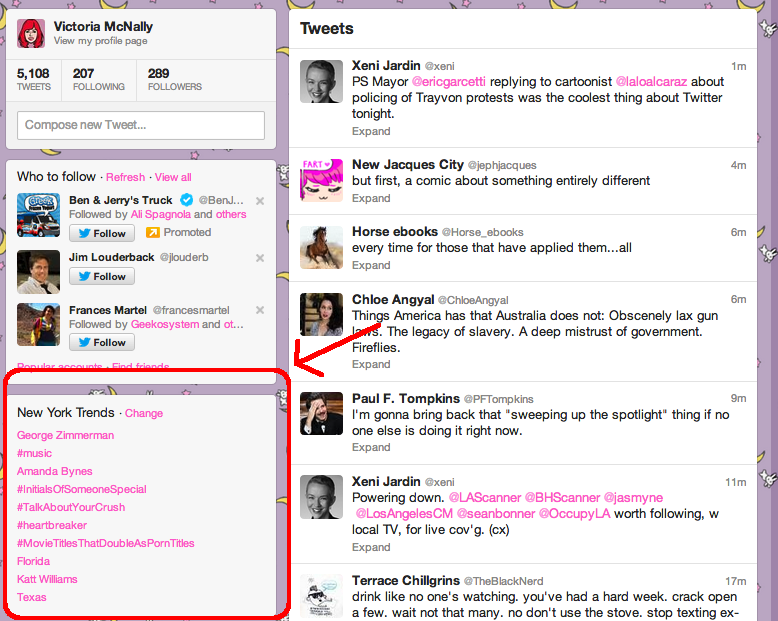 You can use it to display your Twitter timeline, mentions, direct messages, trending topics, search results and hashtags. You can also sync it with multiple Twitter accounts and schedule tweets in advance. 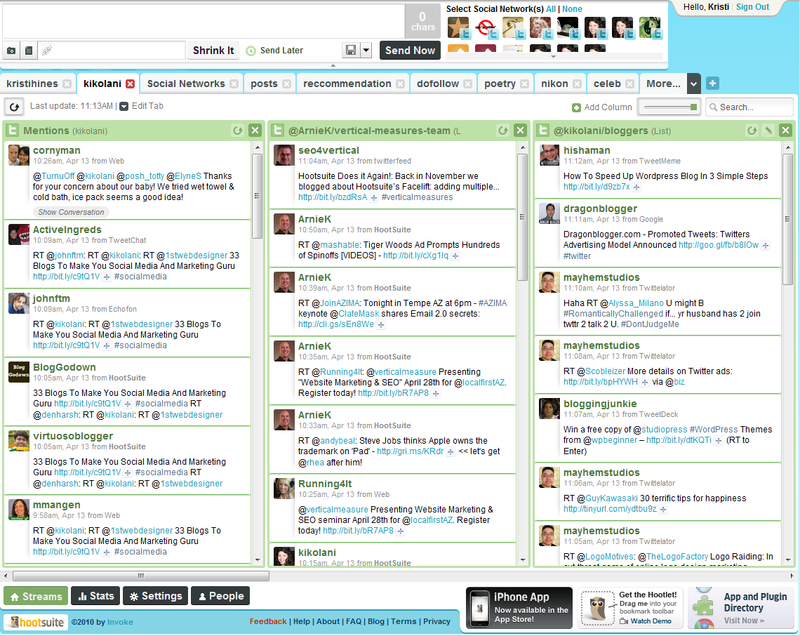 Hootsuite is similar to Tweetdeck in that you can customize, schedule, and display tweets. However, it can also be integrated with Facebook, LinkedIn, Google+, Foursquare, MySpace and WordPress as well. There’s a free version of Hootsuite that you can try, but you have to pay for the extra features, which might be worth it if you have multiple social networking accounts that you want to keep track of. 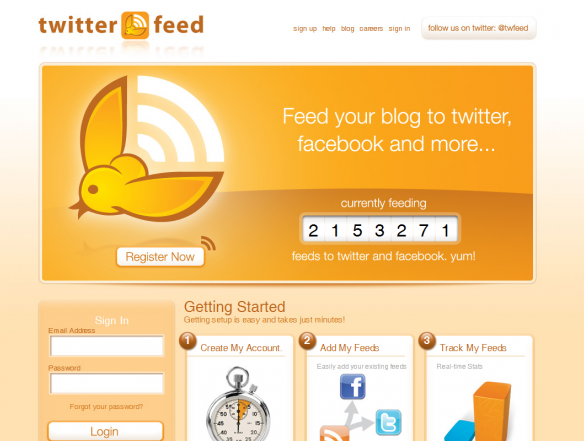 If you use an RSS feed to get your news and information from the Internet and want to share it with your Twitter followers, then Twitterfeed is a great way to do just that. This app syncs up with your RSS feed and automatically posts the stories and links that you’d get there up onto Facebook, LinkedIn, and Twitter. If you have a blog you really like and follow constantly, then using Twitterfeed to put that blog’s posts up to your social media page might be easier than doing it manually yourself! 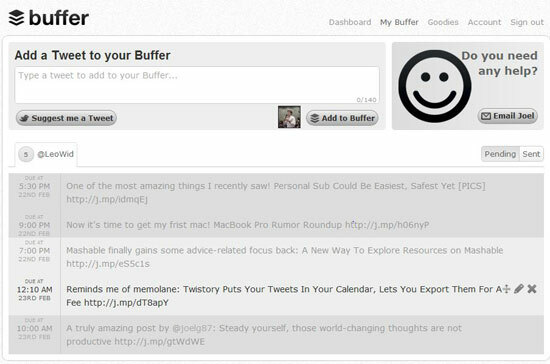 As we’ve covered before, Buffer is a great way to schedule your tweets hours and days in advance of posting. It works with your web browser, so creating a new tweet out of an interesting link is as easy as clicking a button on your toolbar. It also schedules your tweets at completely random times rather than on the hour or half hour, so it looks less like a scheduled post and seems more natural. Personally, my favorite of these apps is Tweetdeck, but you should take some time to download a few free ones and decide which is right for you. Once you do, it’ll be easy to schedule tweets and manage multiple accounts, which will make creating a brand easier for yourself! Now you’ve got a Twitter account and set up your profile page, how do you go about tweeting exactly? After all, Twitter is basically it’s own universe with a strange language and set of cultural cues. Don’t worry, though — we’re here to help you out! This is a dictionary of sorts for all the new words and definitions that have come out of this micro-blogging platform since it first hit the Internet in 2005. Once you have of all these terms down, you’ll be ready to hit the Twitterverse. To create a tweet, you can either select the blank bar underneath your username to the left of the screen, or click on the blue button that looks like a pen on a piece of paper, which is located on the top right of the screen. Remember, you only get 140 characters — not just words but individual letters, spaces, and punctuation marks — so make them count! Twitter is the name of the website. As such, it should be capitalized. If you’re using the word as a possessive noun, however, it’s sometimes okay not to capitalize it — similar to the way that you’d say “my mother” and leave it lowercase, but actually call her “Mother” and capitalize it. Taylor Swift uses Twitter, but you go on her twitter. Get it? Here at BookWorks, however, we tend to stick to capitalizing it at all times. It’s just easier for us that way. Tweets are individual posts on Twitter. It is also the verb used when talking about the creation of such posts, as in “Did you see what she tweeted last night?” Unlike Twitter, the word “tweet” should not be capitalized. A DM, or a Direct Message, is basically Twitter’s version of e-mail — private messages that you send to other users. 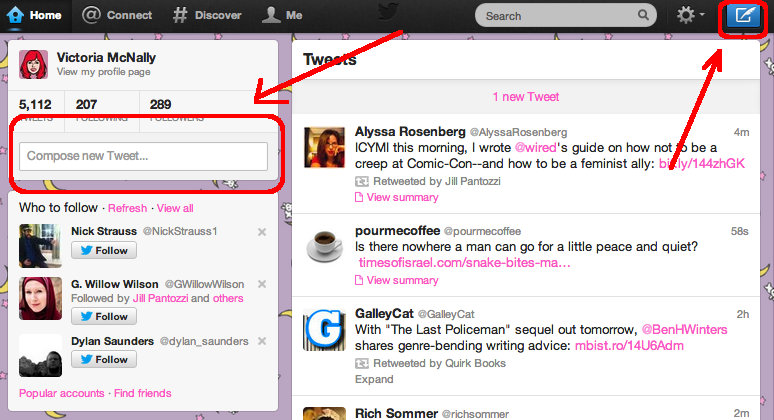 This is my personal Twitter, and as you can see, it’s set up to track New York trends. You can change it to whatever part of the world you’d like by clicking “change.” However, you can’t set them to reflect your interests: they’ll always show you what’s popular on Twitter, for better or worse (looking at you, #MovieTitlesThatDoubleAsPornTitles). You’ve probably noticed by now that hashtags made of phrases are not allowed to have spaces in them, so all the words get squished together. That’s so the hashtag is easily trackable. Including a space or any type of punctuation breaks the tag. Make sure that if you’re using a long phrase hashtag, it’s easily readable by capitalizing each new word or rewording the phrase so that it’s a little easier to parse. This way, you can add a little bit of commentary before the original tweet. Speaking of which, it’s worth pointing out that If you’re attempting to reference or speak to another user on Twitter, you must put an @ before their username. That way it automatically becomes a link that your followers can click on to get the other person, and Twitter will notify them that they’ve been mentioned. When people speak to each other on Twitter, it’s called replying. As you can see, there’s a button there for that as well. When you reply to someone and their username is the first thing in the tweet, this means that only people who follow the both of you will be able to see it. Many Twitter users place a period (.) before as a workaround. Like a tweet but don’t want to retweet or reply to it? You can hit the Favorite button to let the original user know what you think. It’s pretty rare for self-publishers — unless you write about some very controversial topics, of course! — but if another user is harassing you, then you might have to block them. To do that, go to the user’s specific Twitter page. Next to the button for “Following,” there’s a little button with the outline of a person on it. Click it for a longer bar of options, including blocking or reporting a user for spam. Again, you might never have to use it, but it’s good to know where that feature is located just in case. Those are the basics of Twitter vocabulary! If you ever have any questions about the meaning of a particular abbreviation someone might be using, though, try googling it to see if it’s a common Internet phrase. Sometimes people make up their own acronyms and abbreviations to thwart the 140 character limit, so it’s not your fault if you don’t know what they mean! Let us know if you have any questions by telling us in the comments below. Next week, I’ll be looking at some of the different Twitter apps available and how they can help you manage multiple Twitter accounts at once. A few weeks back we covered all the steps you need to create a Facebook brand page for your book. 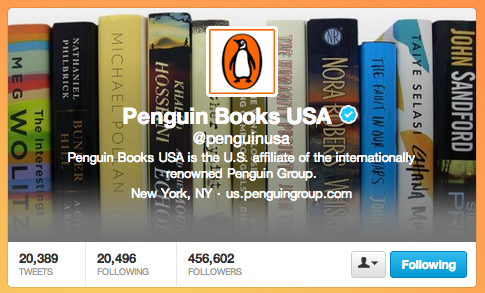 Now we’d like to show you how to get the most out of a Twitter account for your book or personal brand. As you can see, you can only have one Twitter account per email address — this is to keep those dreaded spam accounts that you’ve probably heard so much about at bay. If this is your first account, that shouldn’t be a problem, of course! However, if you want to put together a separate account for your book and for your personal use, you’ll want to have separate email addresses for them. Later, we’ll also show you programs that can manage all your Twitter accounts at once, so you won’t have to worry about getting them confused. Once you’ve signed up and chosen a Twitter handle (which you can change at any time), you’re ready to start tweeting and following other Twitter users! If this is going to be your professional account, it might be worth customizing every part of your Twitter profile for a sleeker look. 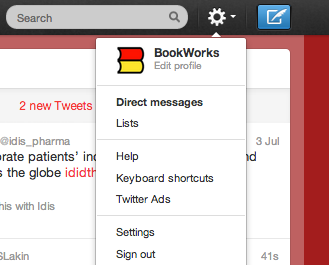 To do that, first go to the gear button on the top right of the page and select “settings” from the drop-down menu. 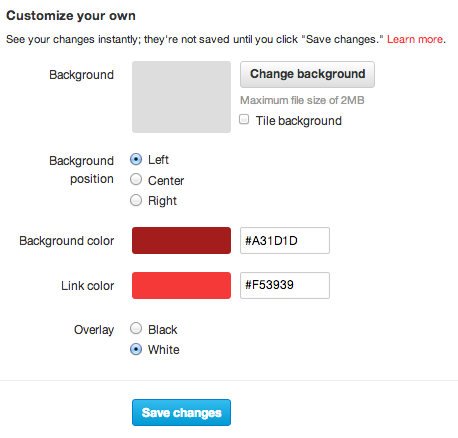 Here you can upload your own background image or change it to a single solid color, like the red that we use. 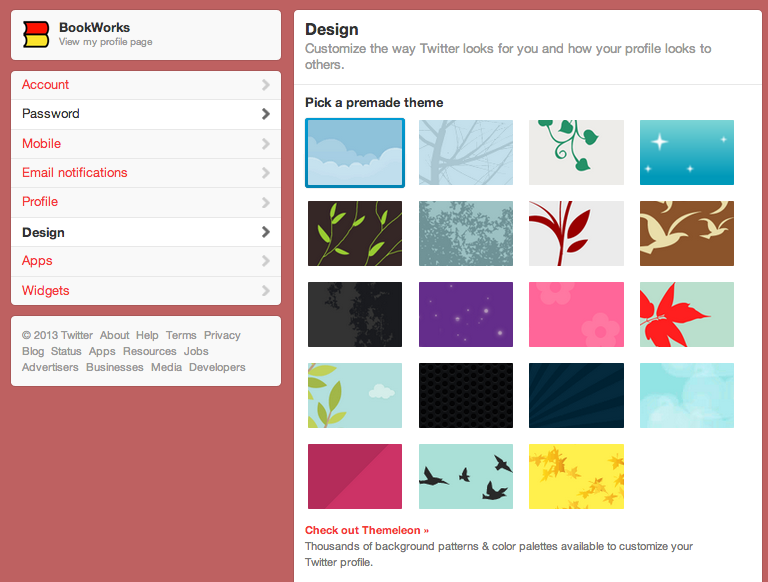 You can also customize the color of the links on your Twitter as well. Once you’re done with that, we’re going to check out the “Profile” button on the right — it’s just above the “Design” button! Here’s you’ll be able to change your profile picture, given name, location, website, and bio. 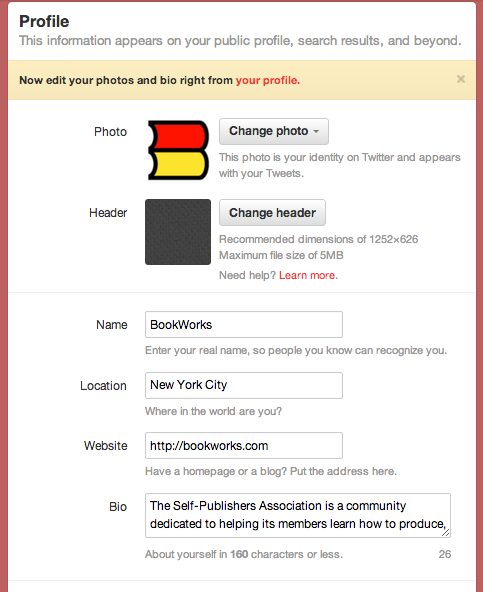 You also have the option of using a “header” picture, which is much like the cover image on Facebook pages. We don’t use one on BookWorks, but they can be good for catching someone’s attention! Now that you’ve set up your account, how do you go about following users? That’s actually the easiest part. First, think about the type of accounts you want to follow. Are you going to use Twitter to get news, or to connect with like-minded individuals — or are you going to do both? 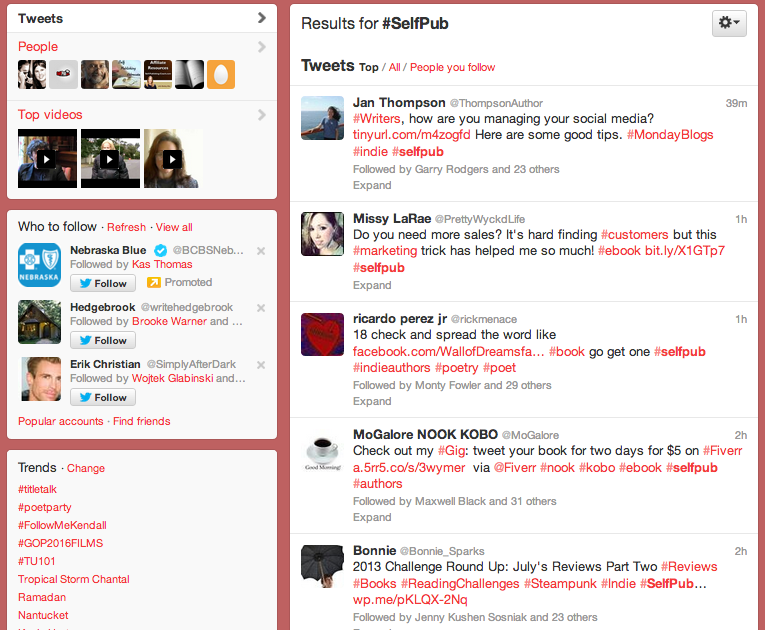 This is a collection of everyone who has ever used #SelfPub in a tweet, so it’s a list that’s sure to be full of people who are interested in self-publishing. Click on their Twitter handles to go to their page, check out the rest of their tweets, and potentially follow them. Clicking on the account you want in the search bar takes you directly to their Twitter page, where all you have to do is click the “follow” button on the bottom right of their user information. After you click it, it will show up blue and will say “following,” just like in the above image. Now that we’ve covered the basics, next week we’ll delve deeper into the strategy of using your Twitter account most effectively. Be sure to check back for more! 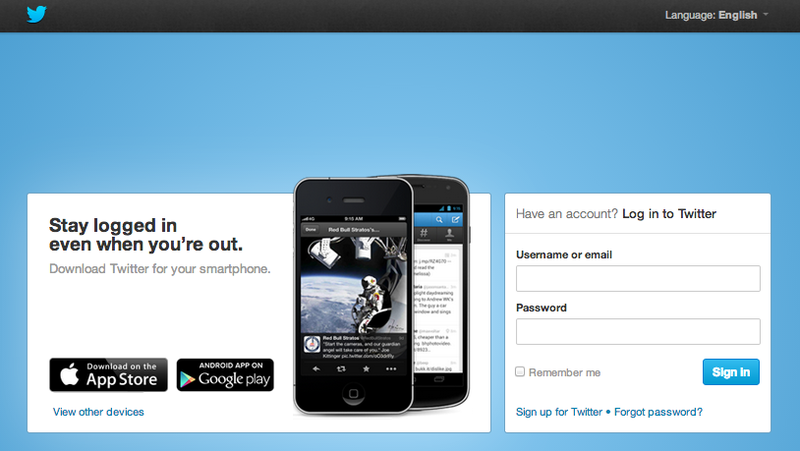 When you first log in, this is what you usually see.